Custom back spa massage magnets work for back spa services that wishes to promote their business effectively with minimum efforts. 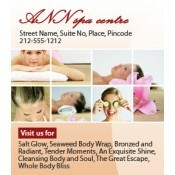 We offer free full color printing which allows spa services to go creative with their promotional campaigns. They can use any color and any visual to make their business information stand out. Save on art setup, online design proof and shipping because their prices are included. This does not mean that spas offering back massage have an easy time in finding customers. They have to work hard to make their businesses accessible and reliable. By now, they might have spent thousands of dollars on advertising with almost negligible results. It is seen that most of these spas employ almost the same kind of tried and tested strategies to advertise their business. It has become more of a marketing competition between the businesses to outsmart each other rather than attracting quality customers. With these beautiful promotional back spa refrigerator and outdoor magnets on the scene, it is going to be lot easier for a spa to promote their back massaging services. With increasing tales about illegal activities being conducted at spas and massage parlors, spas are required to work doubly hard to prove their authenticity. Spa and massage services can employ these promotional magnets to prove their authenticity by propagating special sales which invites attention or advertise special deep tissue massages for athletes, homemakers, etc. Beauty is a topic which buys attention with its versatility and glamour. This means there is never an inappropriate situation for a marketer who wishes to sell his business information through these custom magnets. They can consider it as a year round gift through bulk orders. Colorful logo printed magnets make great giveaways during tradeshows, beauty shows, beauty conferences or they can be sold through leading beauty stores in the area. To know more about special wholesale price benefits, customization and distribution of these promotional beauty and spa magnets, feel free to approach us at 855-762-4638 (Toll Free) or write to us at info@CMagnets.com.